IN STOCK AND READY TO SHIP. Ships to lower 48 states for only $35. Eezi-Awn is proud to introduce the all new Shade, 2.0 Meter Bag Awning. A light-weight, easy to use roll up awning providing over 40 sq. ft. of protection from the elements, and it sets up in less than a minute. 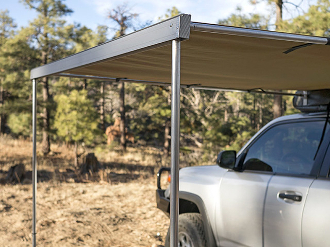 The awning features a self-contained aluminum framework suspending a waterproof 260-gram rip stop canvas panel. Six Velcro straps hold the panel to the rafter arms, and the legs are fully adjustable to any terrain or height up to 92”. The PVC cover is UV resistant, the same material used on pickup tonneau covers. And best of all…. It is made in Eezi-Awn’s Johannesburg South Africa facility. The same facility as their famous Series 3 and XKLUSIV roof top tents. Now that is a level of quality you can rely on.